Product prices and availability are accurate as of 2019-04-21 05:27:38 UTC and are subject to change. Any price and availability information displayed on http://www.amazon.com/ at the time of purchase will apply to the purchase of this product. 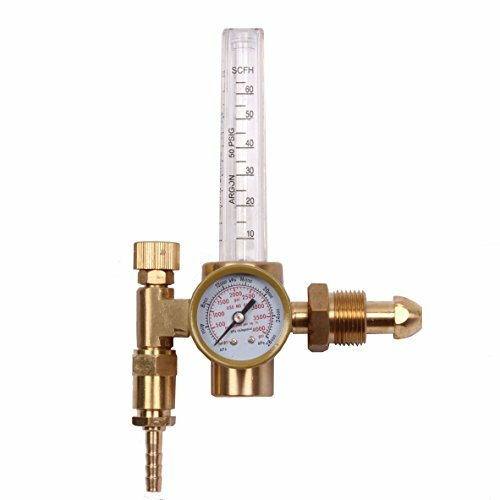 Brand New BETOOLL Argon / CO2 / Helium regulator and flow meter. Flow Meters are more accurate than the flow gauge regulators. The pressure gauge which shows how much gas is left in the tank goes from 0 to 4000/4500 psi. And this flowmeter does not use a diaphragm, so it is more reliable than the flow-gauge style regulators. The output flow is adjustable from 10 to 60 cfh (cubic feet per hour), and is indicated by a ball which moves up and down in the flow tube.